I check the postings on the Perfect Pooch Dog Blog (http://perfect-pooch.com/dog-blog/) frequently. Note: Look to see if a comment has it's own unique URL - click on the date stamp if possible. If it doesn't, just use the URL associated with the blog post. When citing a Facebook note from a particular group, include [Facebook note]. after the title of the post. 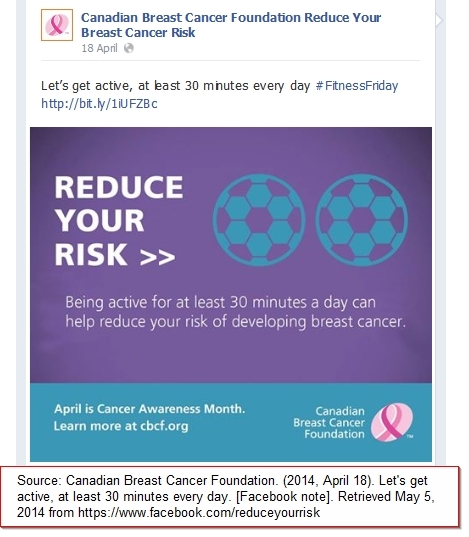 Here is an example of a Facebook note posted by the Canadian Breast Cancer Foundation. LinkedIn profiles can be problematic because some are not available for public viewing! If the LinkedIn profile is not viewable by the public (i.e. in a closed group; everyone can't access it), cite it as a form of personal communication. Note: to find details about the person who pinned an item to complete your citation, you may need to click on the creator's profile image.